Can you believe it? A recipe post from me! It’s been so long. But there’s a reason why the kitchen is the first room I’ve concentrated on during the 31-Day Clean House Challenge. Because for me, a clean, organized kitchen not only makes meal planning and prep easier, it’s an open invitation to cook. And as part of that challenge, I cleaned out the freezer the other day and realized I had several packets of frozen, shredded pork roast that I needed to use soon. I also had several small fresh tomatoes from the container garden I’m cultivating on my back deck. And I recently opened a jar of roasted green chile that I need to either use or freeze soon, before it goes bad. Here’s the original recipe for a version of this. I made a lot more of it this time! Add chiles, tomatoes, oregano, and other seasonings if desired, return to a boil. Reduce heat to low and let simmer at least 30 minutes, up to a few hours, before serving. This recipe makes four (5.5 carbs) to six (3.6 carbs) dinner-size servings. In the last year or two, I’ve developed an addiction to chicken Tikka Masala. And while I can get a decent canned version of the sauce at Kroger (no sugar added! ), I’ve been wanting to make it at home. So this gives me a perfect option and I don’t feel deprived of the naan that I usually sop up the extra sauce with. In the zip-top bag, combine the chicken, yogurt, teaspoon garam masala seasoning, salt, and pepper. Seal bag and smoosh around until seasonings and yogurt are well mixed and chicken is thoroughly coated. Marinate at least 30 minutes to overnight. Pour marinated chicken through colander to remove as much of the yogurt as possible. In large skillet or saucepan over medium-high heat, heat olive oil plus 1 tablespoon butter. Add chicken and sauté until just cooked through. Remove chicken to bowl and set aside. Add remaining 3 tablespoons butter to pan (still over medium-high heat). As soon as it is melted and starting to bubble just a bit, add onions and ginger. Sauté until onions are softened. Add garlic and sauté 1 minute, until fragrant. Return chicken to pan and add tomatoes and tomato sauce, 1 tablespoon garam masala seasoning, and cayenne pepper and bring to a boil. Reduce heat, cover, and simmer 10 to 15 minutes. Add 1/2 cup cream/coconut milk and return to a slow simmer. If sauce is too thick, add additional 1/4 cup cream/coconut milk OR tomato sauce. Remove from heat and stir in cauliflower rice. Taste and re-season if necessary. Arrange prepared peppers in a baking dish just large enough to hold them all standing upright (9×9- or 9×13-inch with tall sides will probably work well for four large peppers). Using a slotted spoon, fill each pepper with tikka masala. If desired, pour any remaining tikka masala sauce over peppers/into baking dish. Bake 30 to 40 minutes, or until peppers are cooked through but not mushy. *I purchased ready-made garam masala—be sure to look for a mixture that doesn’t include paprika. You can find a recipe to make your own mixture at All Recipes. I have a stick blender that came with a small “food processor” attachment, which was perfect for this. You may end up with uneven sized pieces, but mine cooked down enough that it was hard to tell it was there anyway. As mentioned in my previous post, I’m trying to follow the Activate cycle of the 17-Day Diet (visit that post to find out more about it). Which means finding new and tasty ways to make poultry and fish dishes, since those are the only meats allowed during this cycle. As I’m not really a big fan of fish (other than salmon, catfish, and tilapia), I’ve been trying to think of ways to make it that aren’t difficult and that are very tasty. Which led me to thinking about the marinades I’ve done here on the blog. One of my favorite was Orange-Lime Pork Chops, and I thought I could adapt it for salmon. And, boy howdy, was I right! Combine orange juice, lime juice, and olive oil in plastic bag. Add salmon fillets. Remove as much air as possible, seal, and then gently smoosh around until the fillets are completely covered with the marinade. Marinate 30 to 60 minutes at room temperature, turning the bag at least once. (I set a timer for 30 minutes, then turned the bag; I then prepared the cauliflower and zucchini for roasting. By the time those were ready to go into the oven for 10-15 minutes, the hour was nearly up for the marinating and it was time to cook the salmon). Remove salmon fillets from bag and blot skin side with paper towels. Because I knew I’d be eating one of my two fillets for another meal, I only cooked it on the skin side for two and a half minutes and the flesh side for thirty seconds, so that it wouldn’t be overdone when reheated. But I like my salmon on the medium-rare side of just cooked through. Don’t be concerned if the skin of the salmon looks burned when you flip it. The juices will make it caramelize darker than you’d think. Even though mine looked blackened, it didn’t taste that way. The skin was perfectly crisp and tasty. You may want to reserve a couple of slices of lime to garnish your plates and squeeze over your salmon before eating—but I liked them just the way they came out with nothing more added. Sorry this blog has been so quiet . . . I’m planning to spend some time over the winter holidays putting together a (very ambitious, I’m sure) plan of a mix of new recipes to share and old recipes to re-try/revamp starting in 2017. Here’s a great hot dip recipe for potlucks and finger-food parties. This stuff is yummy on pretty much everything (veggies, meat, etc.). In a medium bowl, whip together cream cheese and mayo until well combined. Stir in jalapenos, bacon, and cheddar. Spread evenly in baking dish. Bake 20 minutes, or until bubbly and top starts turning golden brown. Let sit/cool about 5 to 10 minutes before serving. Serve warm. *Cooking will mellow the heat of the jalapenos slightly, so it may not be quite as spicy coming out as it is going in. For Christmas, if you want to add red in with it but can’t find red jalapenos, you can always add red bell pepper. I did this in the toaster oven, and it turned out perfectly at the same temperature and time for cooking. 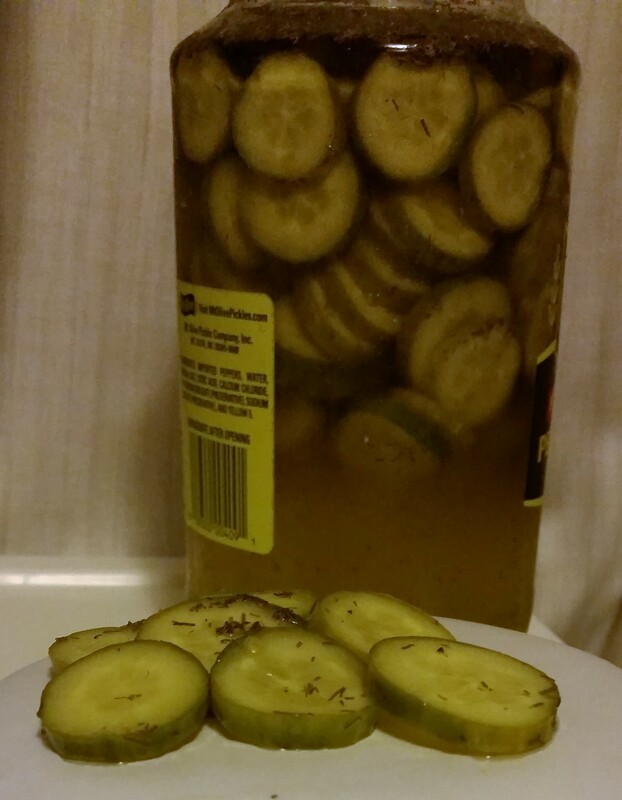 In case you missed it, on Saturday, I posted #LowCarbRecipe: What Can I Do with All That Leftover Pickle/Pepper Juice?, a recipe for making use of the leftover liquid in pickle and pepper jars after the pickles and peppers are gone. As promised, this is my follow-up post now that they’ve had a few days to pickle. Yes, I’m still here!!! I know it’s been months since I’ve posted on this blog, but I’m hoping to get started up again here soon. As I’ve mentioned before, I struggle with depression—and now that I’m on a medication for my psoriasis that exacerbates symptoms of depression, I’ve been struggling more than ever. The good thing, though, is that both the medication for the psoriasis and the anti-depressant I’m on to try to balance me out both have “loss of appetite” as a major side effect. And I’ve experienced that to the effect of about fifty pounds lost in the last eight months. However, rather than being a passive participant, I’m ready to start actively controlling my nutrition to make sure that I’m making healthy choices, not just losing weight in an unhealthy manner (because I’m allowing myself to eat whatever I want because I know I don’t eat enough during the day to get in a healthy amount of calories). What Does That Have to Do with Leftover Pickle/Pepper Juice? Last week, there was a piece on Mental Floss enumerating several things that you can do with the juice that’s left over after you eat all of the pickles from a jar. (12 Uses for Pickle Juice.) One of the main suggestions is to slice fresh veggies and put them in the juice to pickle. Because pickles are one of my go-to low-carb snacks—and because I and many others in my family are pickle addicts from childhood, I posted it to my Facebook wall. And we got into throwing around some ideas of things we can do with our leftover juice. I happened to mention that I also like to snack on Pepperoncini peppers and in addition to using the leftover (spicy) juice from those to dress greens with (spinach, turnip greens, mustard greens, etc. 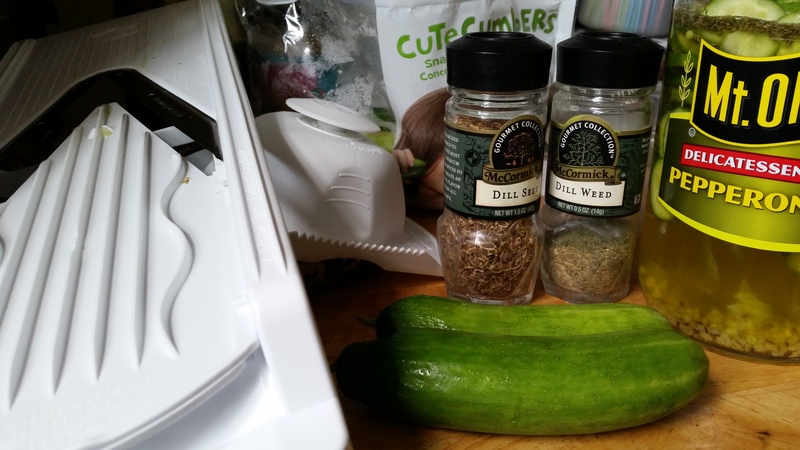 ), I might try using it for pickling other veggies, too. 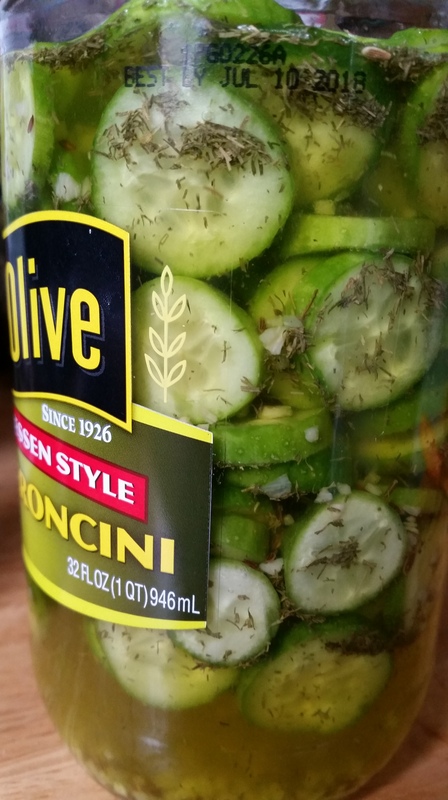 Well, today, I found myself with half of a 32-ounce jar of leftover pepproncini juice, while I still have some left from a previous jar to use for greens. So I decided it was time to put it to work. Add garlic, dill weed, dill seed, and salt to juice in pepper jar. Make sure lid is sealed tightly and then shake vigorously to combine. Set aside. Use knife to cut off non-stem end of cucumber. Slice using knife or mandoline into approx. 1/4-inch-thick rounds. Add slices to jar. Keep adding cucumbers to jar until only about 1″ of juice remains unfilled at the bottom of the jar. Fill jar almost to top of rim with vinegar. Again, make sure lid is secured tightly and then shake vigorously to ensure even distribution of cucumbers, herbs, and spices. Store in fridge 1 to 2 days. Gently shake jar occasionally to keep everything stirred up. Pickles should then be ready to eat. Now, because I’ve just done the “put it together” part of this recipe, I don’t know for sure how they’ll turn out. I’ll check back in several days with a follow up.